Ten years ago, while he was climbing in the Italian Alps with a group of friends, Matteo kept asking himself one single question: ‘what did I get myself into?’. Besides suffering from vertigo from time to time, there was something about the mountains that made him feel uncomfortable. So he thought he would never do something like that again. However, last August, this now 31-year-old Italian traveled to Japan and made it to the top of Mt Fuji (3,776 m) -a perfectly symmetric volcano, the highest and most beloved peak in the country- together with Chikako, a JMGA-certified mountain guide. Climbing Mt Fuji: why not? “My trip to Japan was a last-minute trip. I was able to find a very cheap flight and said, ‘ok, it’s in one week but, why not?’. Some friends told me that in summer you could climb Mt Fuji, which I didn’t know. I was traveling on my own, so I thought: am I really sure that I don’t want to climb a mountain anymore?”, says Matteo. Climbing Japan’s worldwide symbol (and one of the country’s three holy mountains) popped into his mind as a personal challenge. 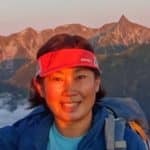 So he contacted Explore-Share and -within a couple of days- he was already exchanging emails to set up his 2-day ascent to Mt Fuji with Chikako. Matteo told her about his anxieties during his previous mountain trips, along with his fear of heights and voids: “she really understood my kind of fear and how to build a relationship with me”, he says. Chikako also gave him some advice about clothes and weather. During the summer months (from June to August), temperature in Tokyo can rise over 30°, while at the top of Mt Fuji it can be as low as 0°. “This conversation with her was very important, otherwise I would have freezed -he says-. In the articles on the web, almost nobody mentions things related to the weather and clothes. You need to be prepared and get the right stuff”. As he didn’t have much time before the trip, he decided to buy his mountain gear in Tokyo. It was very easy for him to find a store and he even sent some pictures to Chikako to ask for her opinion! A 2-hour bus ride from Tokyo took Matteo to the beginning of Mt Fuji’s trail. He met Chikako at a red torii, a traditional Shinto gate. She briefed him about the different routes to the top and showed him their route on a map. She also gave him some valuable advice to deal with altitude sickness to lower his fear: ‘drink some water every 45 minutes, make sure you breathe deeply, you’ll probably feel a little headache tomorrow when you wake up, but it will be fine’. For Matteo, ‘these simple tips were important because they gave me the feeling that everything was under my control”. The first hour of the trail was like walking on the moon: everything was grey, there were no trees. It rained the whole day. “I climbed Mt Fuji but I never saw it, it was so humid you couldn’t see anything! But that added some charm to the trip: I never saw how big Mt Fuji was until I got to the top and saw the clouds at my feet”, he remembers. They arrived at the mountain hut by 5 PM, with their clothes completely wet. They had dinner all together and slept for a few hours. “At night, there was a little Japanese child who was very scared. She couldn’t breathe properly because of the altitude. If Chikako hadn’t told me you could feel altitude sickness, I would have panicked as well, but since I knew it was normal I woke up and gave her some chocolate…imagine, me!”, he recalls between laughs. By midnight they were already hiking to the top: “it’s always super crowded, but we arrived very early and had time to eat some hot noodles to restore our energy a bit before watching the sunrise. It was perfect”. Above the clouds: magical sunrise at Mt Fuji. © Matteo Franza. Japan is usually referred to as ‘the land of the rising sun’. Watching the sunrise from the top of Mt Fuji certainly illustrates this in a perfect way. Witnessing this moment can be so overwhelming that there’s even a Japanese word to describe it: ‘goraiko’. “It was a breathless experience. I don’t think I have the knowledge to describe it, I won’t give justice to this experience with my words. But what I really appreciated was that I earned it by working for a day and half. I was there, I had planned it with days in advance, I spent a whole day in the rain, and all that really prepared me to appreciate this moment of beauty”. After watching the beginning of a new day from the top and still with a great sense of achievement, Matteo and Chikako made a 2-hour tour around the crater of the volcano and reached Kengamine peak, the actual highest point of Mt Fuji. They started their descent at 7 AM and got back to the Fifth Station 3.5 hrs later: “by the end I was exhausted but my legs were OK. Chikako really helped me, we stopped frequently and did some stretching”, he says . For Matteo, traveling with a local mountain guide was key for the success of the trip. “You can be a beginner and climb Mt Fuji, but the information you may read on the web never advises you to get a guide. And I think I would have never enjoyed the trip as much as I did without a guide”, he admits. Communication & trust. “I think Chikako and I were really able to build a good communication so even before meeting her I already trusted her. For me, Japan is on the other side of the world. But during the 2 days that I spent with Chikako, I never felt unsafe”. Empathy. “What I really appreciated in Chikako was that she knew how to handle me…she made me realize that I could do it, and she was always there to give me support. She had this kind of empathy, she really took care of me”. Knowledge of the place. 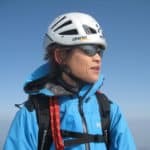 “Climbing with her allowed me to learn about the history of Mt Fuji: why people started climbing it in the past and how it’s related to Japanese culture and traditions. That really made it meaningful to me”. He also highlights the work done by the Explore-Share team, who were very supportive and managed to arrange a trip with very little time ahead: “It’s the small things that make the difference. I really found the Explore & Share experience and service beyond my expectations”. Another view from the summit, with a Torii gate. © Matteo Franza. “I took this journey and in the end I discovered myself. It may sound naive, but I’m now aware that I can do it… I gained some awareness about myself, I learnt more about myself. I spent 2 weeks in Japan on my own and what I really recall are these 2 days in Mt Fuji”. His plans for the future include giving the Dolomites and the Italian Alps another chance: “I want to try to do the same things I did years ago but with the new perspective I now have. I even have proper clothes to do that now!”. Want to live a life-changing experience in the mountains like Matteo did? Check out all our programs in Mt Fuji, as well as many other options for guided hikes in Japan. What are the Differences Between Hiking, Trekking and Mountaineering?